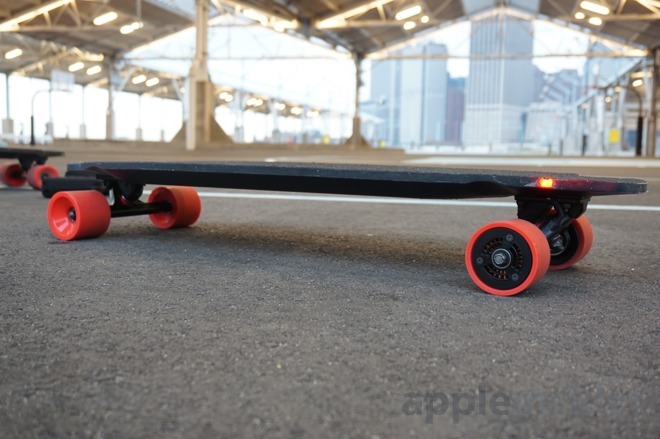 With a unique design that places its motors inside the rear wheels, plus connectivity with the iPhone and Apple Watch, the forthcoming Inboard M1 electric skateboard promises to be a ride unlike any other. 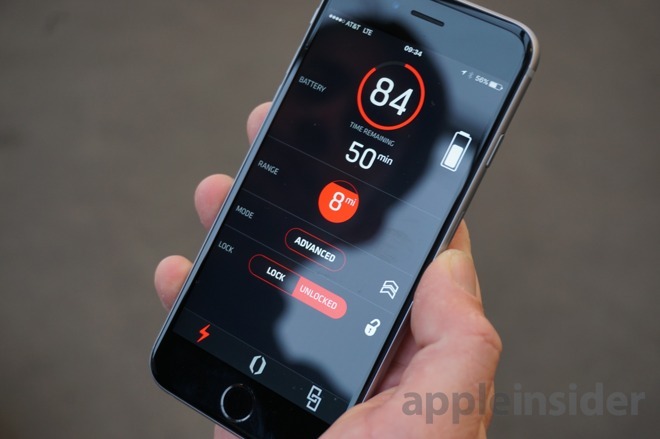 AppleInsider has tested the company's latest prototype ahead of an early 2016 launch. 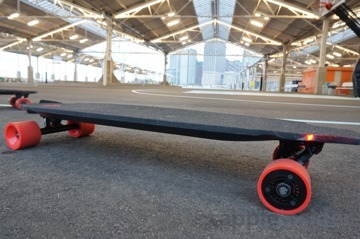 As the M1 moves closer to production, we went hands-on with the latest prototype in New York City this week with Inboard co-founder Ryan Evans. 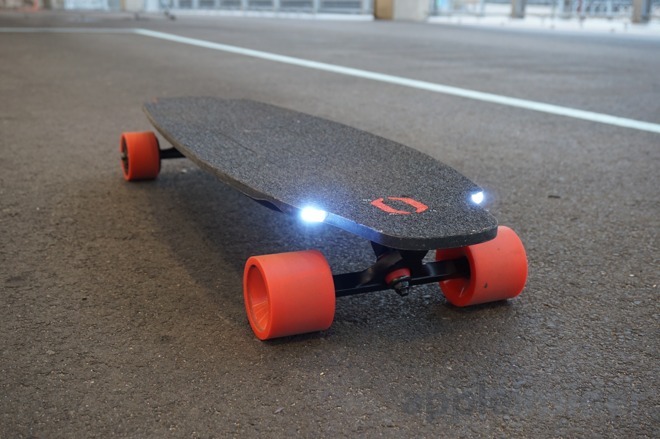 The board features a sleek design that includes a discreet, small, user-accessible cavity on top for the board's swappable battery, as well as LED lights integrated into the front and rear of the board for safe nighttime riding. 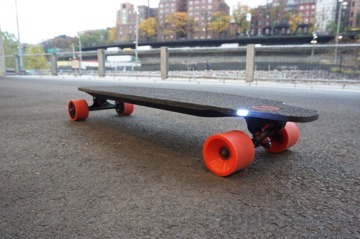 Coupled with the fact that the board's motors are encased within its rear wheels, the M1 offers a clean, stealthy look that hides the fact that it's an electric skateboard. The unique design stands in contrast to other products currently on the market, which tend to be bulkier and feature protruding motors. Integrating the motors into the wheels also prevents drag on the board when it's not being accelerated. In contrast, with other electric skateboards, the external motor and belt provide resistance when coasting or pushing by foot. We felt the difference immediately when riding the M1 this week —as soon as we let off the throttle, the board kept coasting with no noticeable resistance from the motors or wheels. Another unique feature of the M1 is the swappable battery. 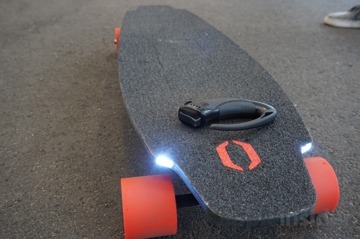 A single battery will offer about 10 miles of range with moderate riding, but users will be able to quickly open a discreet door atop the board and replace it for extended range. Spare batteries will cost $249. In addition, the smart battery will also include two USB out ports, allowing users to charge the board's hardware remote, an iPhone, or even Apple's new 12-inch MacBook, if so desired. The board itself, which is available for preorder now for $1,399, also offers compatibility with the iPhone and Apple Watch. In particular, the Apple Watch app will allow users to quickly check their wrist to see current speed, or how much range is left on their current battery charge. 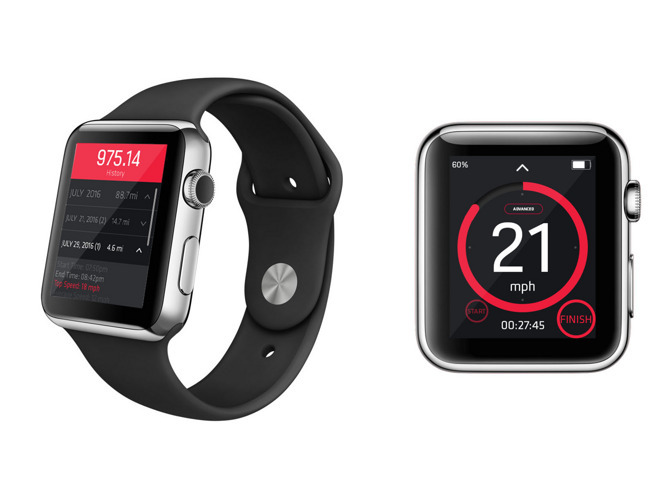 The iPhone app will also let users know how battery-efficient their riding style is. While the M1 will travel at up to 24 miles per hour, faster speeds will obviously result in a shorter total distance on a single charge. 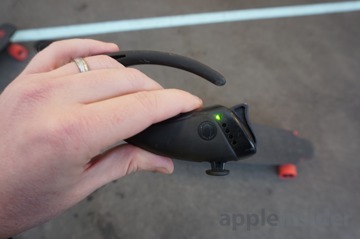 M1's iPhone app can also be used to accelerate and brake while riding the board if a user chooses, instead of the hardware remote, similar to the Yuneec E-Go AppleInsider reviewed last year. The app can also be used to lock the wheels, preventing potential theft when the iPhone is not in range. iPhone and Apple Watch development are not yet completed, but we did test out the Inboard M1 with its dedicated Bluetooth hardware remote. It features a trigger on the front that must be pressed for speed control, with a rocker up top that can be pressed forward for acceleration, and backward for braking or reversing. The M1 weighs in at 14 pounds, and supports riders weighing up to 250 pounds. Leaning to turn the board was easy even for us, not being regular longboarders. The M1 can even stand up to more extreme use, as Evans demonstrated that the device could be used for powersliding, even with its motors embedded in the rear wheels. The Inboard M1 is currently available for preorder from the company for $1,399. Orders submitted now have an estimated shipping date of February to March of 2016.